My daughter was watching the Scooby-Doo, Where Are You! episode Foul Play in Funland yesterday. 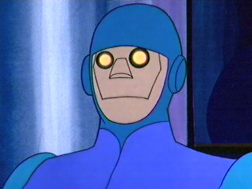 The episode is about an operator who wants a fleet of robots to run his of an amusement park. In the end, his sister foils the idea because she doesn’t think children shouldn’t operate a place for children. I thought that was quite forward thinking for 1969. Today I was on the phone was my gas company since my furnace wasn’t working. I should say I was on the phone with myself. Service, Repair, *my phone number*, *my name* and a whole lot of yeses along the way. In the end, a human got on the phone to schedule an appointment. I felt so relieved when a person came on. I always feel like such an idiot talking to those automatic speech recognition systems. Then you try and beat one by pressing all sorts of buttons to try and get a human. Most times, that just prolongs the agony. That got me thinking of how much robotic interaction impacts our our lives. Is it really a good thing? Does it not matter to most people? Is it one of those things that won’t matter to our kids if they are around it from such a young age? As an example, I would much rather push buttons on a phone and interact with a computer like I’m programmed to do instead of talking to it. The reality is though, the computer doesn’t really care. How do kids decide robots are worth talking to? A Robot in Every Korean Kindergarten by 2013? Do you have an opinion on talking to automatic speech recognition systems? What are your thoughts on the impact of children and robots?